After a few bummers on the coffee front over the last few days in the capital of cloggs and tulips, I found my way to Hartenstraat 12 and Screaming Beans. Just the name is enough to make you want to go there, but what coffee! 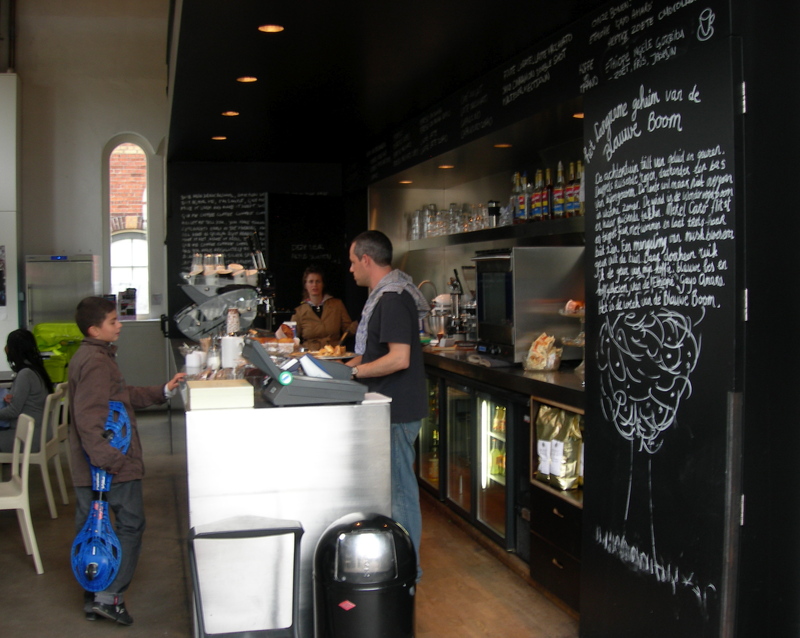 It is a place well worthy being called a coffee fanatics mecca in Amsterdam. 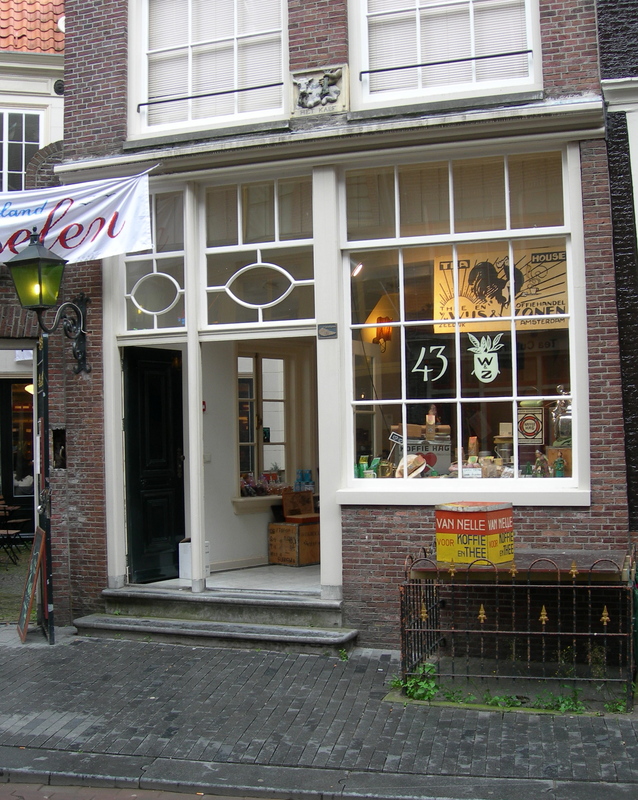 An easy five minute walk from the Dam Square, past the Royal Palace, and you’ll find this little gem of a place on one of the short, busy sidestreets off Keizersgracht. Screaming Beans uses beans from Bocca, a small roastery situated in the Jordaan district of Amsterdam. Mainly sourcing their beans from organic farmers in Ethiopia and Kenya, they buy small exclusive batches of beans to keep the quality high. Just how I like it. It is also possible to buy their beans at Screaming Beans for you to take home. I mean, if you hadn’t had enough of coffeey goodiness for one day. Have to do that next time I’m around. 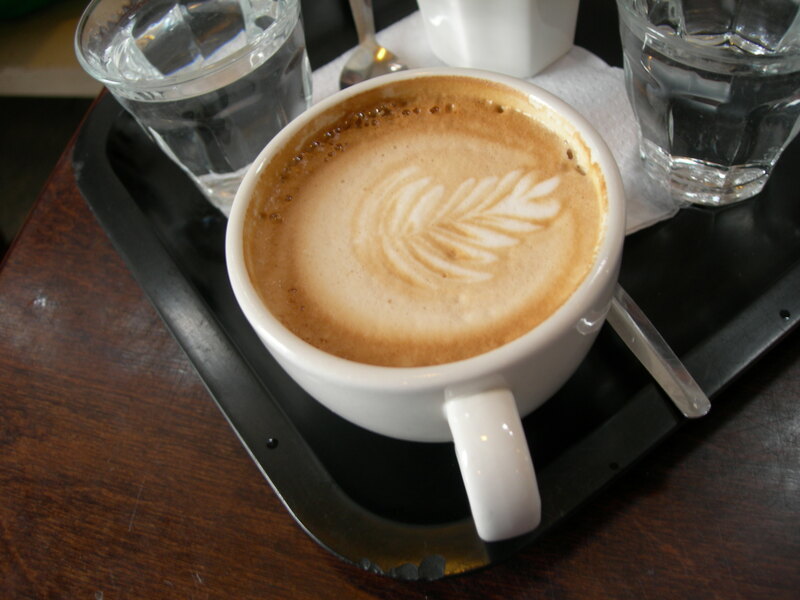 I kicked off with a macchiato which was a smooth concoction, well balanced espresso versus milk froth. No bitterness in the aftertaste. Perfect. When I asked for something more “original” I was served a cup of pour over on a freshly ground Ethiopian blend called HailesLassie. It was one of the last cups since the blend is now finished (it was created for a barista championship in Maastricht, the nice barista informed me, but in the last minute the barista competing changed his mind and created another blend whereby this came on the market for Screaming Beans to grab. For that feat I can only congratulate them) but they have plenty others which I’m sure are equally as good. This blend had a very deep fruity tone, some surprising papaya tint to it, and though not overly strong and dark, which is usually how I like it, it was a great pour. 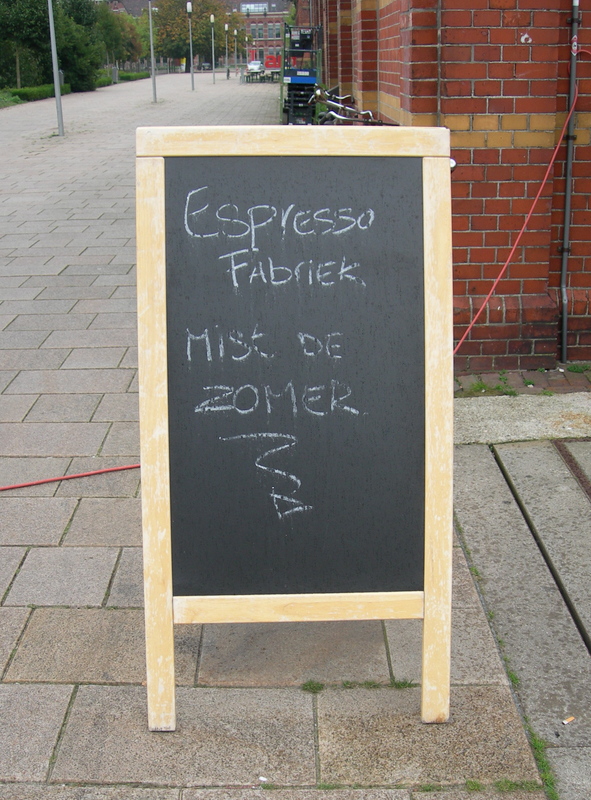 Good coffee is hard to come by in the Netherlands. Even in the multi international capital. It is said to be getting better, but I guess I haven’t been here long enough to really tell. At times I am still chocked over the quality at some places who gives them self out to be “the real thing”. I can only say beware and be warned. 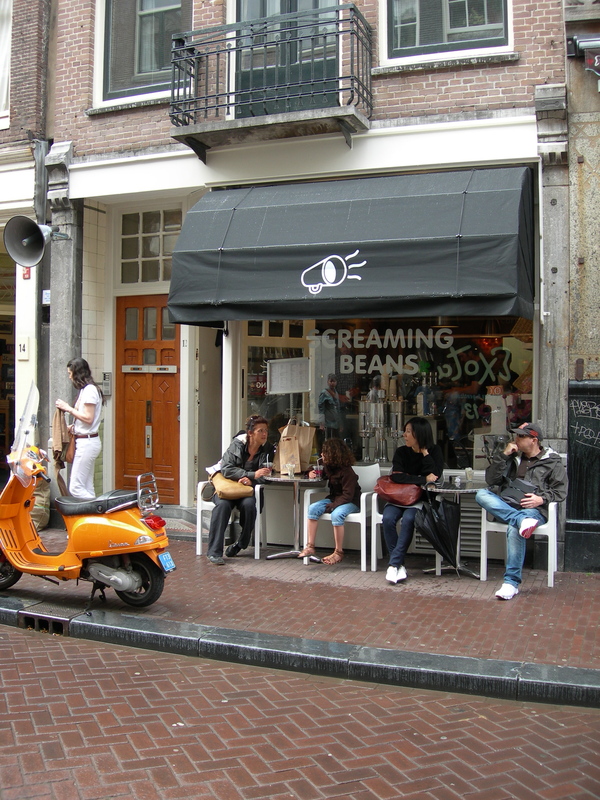 Screaming Beans though is a place to visit when you’re around in Amsterdam as a coffee connoisseur. Or coffee junkie for that matter. It is good. Very good. Can’t put it any simpler than that. My only critique would be that they close very early, at 5pm every day (which is a shame) so check the opening hours before you go. To their defense they are open on Sundays, which is rare over here. Maybe there’s a good reason for it all, I didn’t ask, but hopefully they’ll do something about that soon and stay open longer for us all to enjoy. 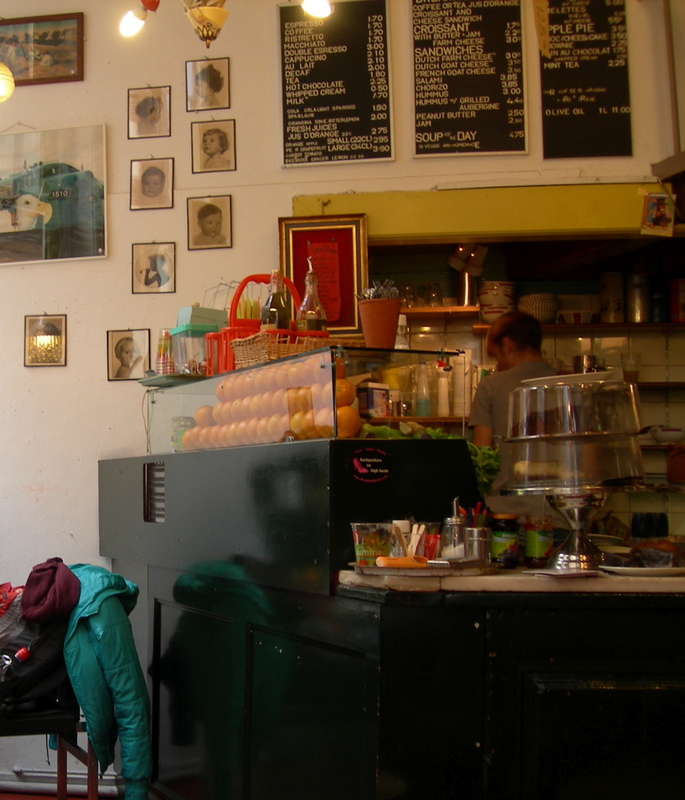 Is this the best coffee house in Amsterdam then? No, not when it comes to the coffee. There’s no reason beating around the bush. Latei on Zeedijk 143 is not the best coffee in town. Good, but not great. It is, however, one of the most characterfull places I’ve visited since moving here. 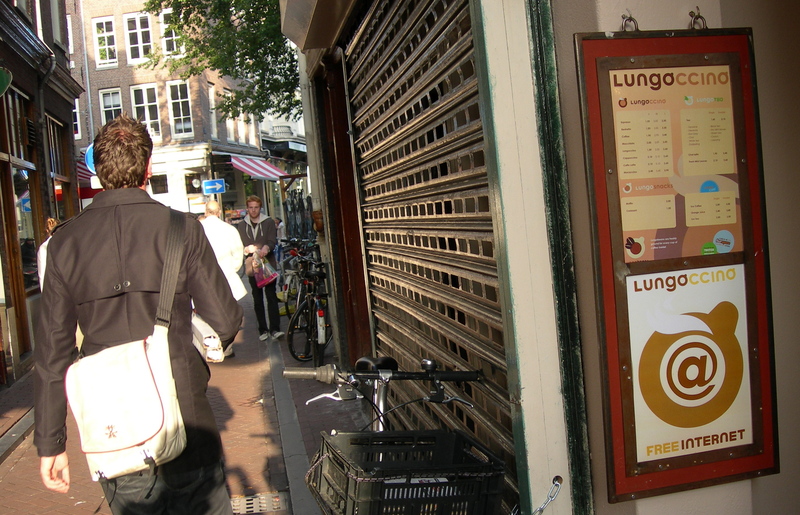 It is situated by Nieuwmarkt , just at the end of Amsterdam’s China Town district. Walking past, it looks like a really tacky junkshop at first. But if you give it a second or two you see that it is full of chic students and an arty clientele. Full of horn rimmed glasses and knitted, if terribly expensive, sweaters that are just the right shade for bohemia. If you see what I mean. I’ve never seen so many intellectuals crammed in such a small space in my life. The only thing that beat this, if only just, is probably the photographs of Sartre and de Beauvoir sitting with friends in Paris in the 1960s. Latei don’t just serve coffee. 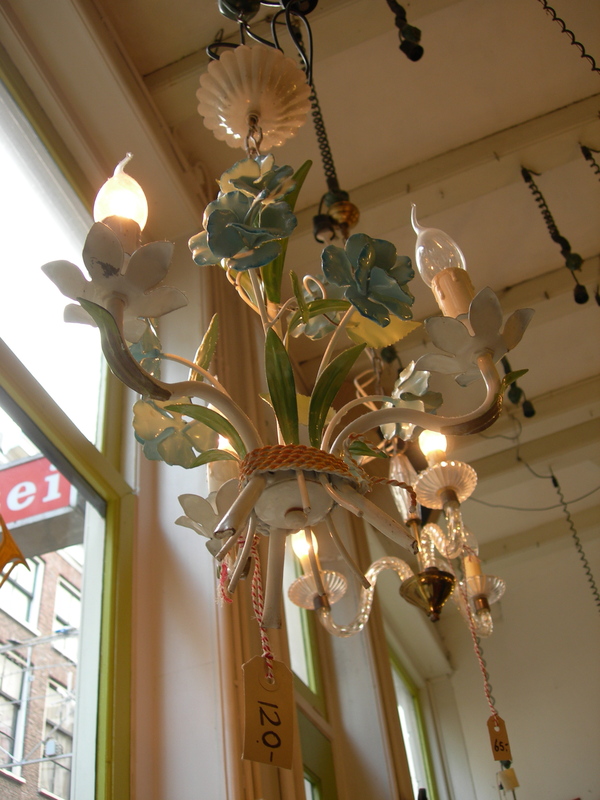 They also sell vintage bags’, dinner china, glasses, chandeliers and quirky stuff you really don’t need but could kill for ‘cause it’s just so cool. In general I don’t care about cool, but after having found this place I do. How will I survive without a 1970s freestanding cigarette lighter? I just have to do my best. Or go back and buy it. It’s only €7.50 after all. The atmosphere is what makes this place so great. As I said above, the coffee is good but not world class. For my second order I actually couldn’t be bothered to order another coffee. Instead I opted for the freshly pressed orange juice and a croissant. The juice was really nice and, believe it or not, the croissant was a dream. Really buttery without going soggy. I have to try one next time as well to see if it was just pure luck or if the croissant level is consistently high. If it is, that’s just another reason to come back here often. The staff is sweet, helpful and what seems to be the standard requirement in Amsterdam: good looking students working extra. Over here I’ve hardly seen café staff over the age of 25. And as long as the service standard is high, I could not care less. With its white walls, overwhelmingly bright wallpapers and lime green windowsills this is one of the quirkiest but nicest places I’ve been to. London included. A place like this in London would have been way under the standard I expect from a place serving food and drink, but here it smells nice and all is clean and fresh. For this I love Amsterdam. If you’re looking for a nice place to relax and read a book (as long as it is not by too common an author) this is where you must go. When I started writing about coffee and this Grail like hunt for the perfect sip began, I wasn’t really aware that it would turn into an actual quest followed by a surprising number of people out of which I know, maybe, 15%. And it got me thinking about what I’m really doing here. I’ve had positive acknowledgement from some coffee houses after they’ve been featured. There’s also been one or two vague suggestions in the comment section of the blog that I should try this or that place because of the amazing coffee they always have there. Most likely that’s because they are staff or owners of the recommended place. Yes, I can see the email address when I approve a comment so try to be subtle. Please? But I really appreciate the amount of hits the posts get so I shouldn’t be too sensitive on the subject I suppose. 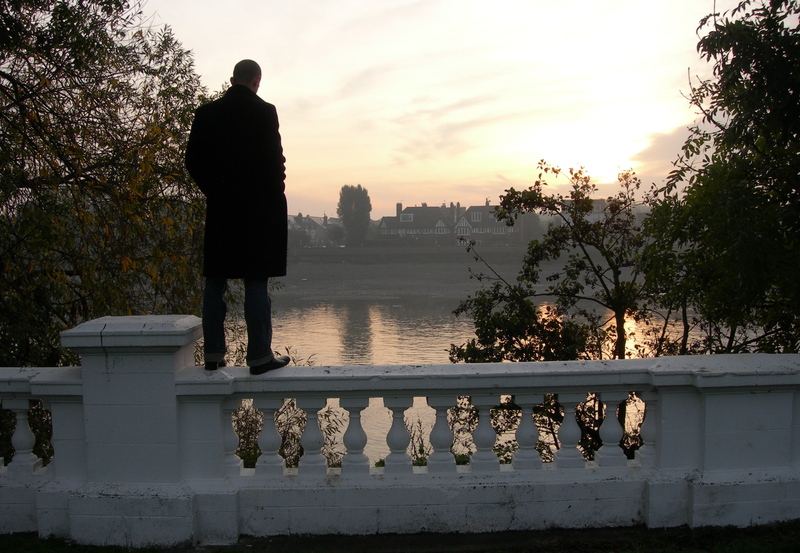 What I’ve also been thinking about is what different criteria and qualities I’m looking for. I think the main things are from my own time as restaurant staff when I was younger. Having filled basically all positions available, and imaginable, in restaurants and cafés from the age of 14 I have a pretty good idea about what I like and don’t like. And also what is possible and what’s not. When I see a coffee house owner being lazy I see red and start hyperventilating. Not using his full imagination and his or his staffs’ capacity makes me really cross. If you have the opportunity to create something stunning and unique: do it! That’s what makes people like myself talk and write about you and your place. That, after all, is what you want isn’t it? Regardless of it being contemporary or housed in a 17th century building, it must fit its own environment. Brushed stainless steel might very well work in a baroque building, it just demands more of the owner and interior designer when creating the coffee house. Clashes of styles from different eras can be the coolest, most up-to-date and inspiring ever, as long as it’s done well. It is such an important part of creating a nice atmosphere. You might think this an obvious thing not needing to get mentioned. Well, no one is as sorry as I that it has to be brought up. A beautiful, virtually perfect place can be ruined because of bad staff. Laziness, noninterest, slow service and rudeness are just not on. Waiting for over ten minute for ones coffee when it’s just me and the barista’s boyfriend there is unacceptable. It happens much to often. When you’re lucky to be served by a genuinely service minded and smiley person though, it’s such a joy and my belief in humankind and my hope for the service sector is always restored! Usually to be shattered in time for my next visit. This really isn’t something I care too much about when writing about these places. A coffee won’t set you back too much. Never ever. 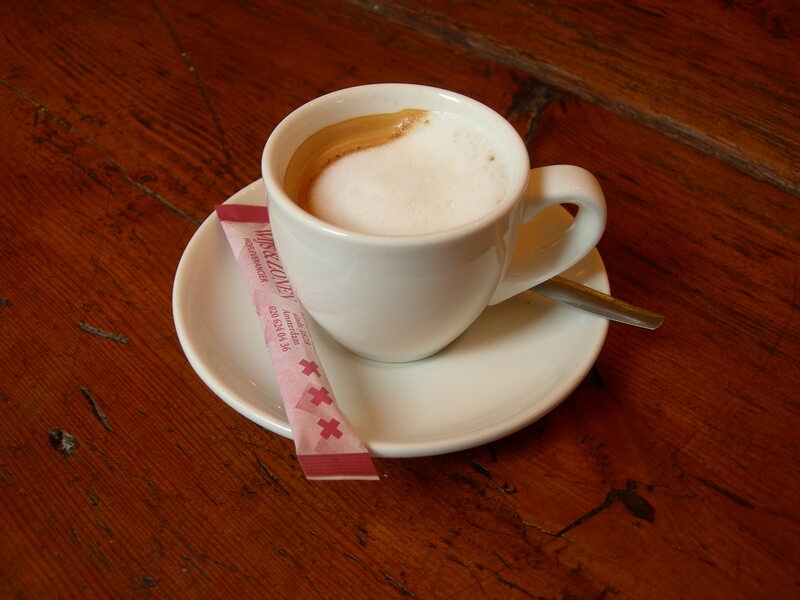 Just enjoy the fact that a good macchiato will never be as expensive as a glass of Chateau Petrus. Luckily. It needs to be top notch, top of the game, go the whole nine yards and, well, you get it now I’m sure. A lousy coffee can make me swear never to return. If the drink is beyond saving, I can’t even be arsed to send it back. If you have a barista who is incapable of handling the machine in the first place, why believe that he could do so on a second try? Cynical perhaps, but I have better things to do than drink putrid acid claiming to be an espresso. Basta cosí. So all in all it is pretty basic and easy, wouldn’t you say? Do the best you can, make a real effort and there you have it: success. The food and drink blogging community will love your place and it will be the thing everyone talks about, the place that serves the best coffee all categories. I can’t wait to pay You a visit! I’m considering putting together a web based compilation of really good coffee places in the UK, the Netherlands, Germany and Sweden. These are the countries I spend most time in when travelling. Hopefully I’ll have the opportunity to add more countries along the way. The reason? Well, when sitting here in my rented flat it’s a thought that strikes me over and over again since there really isn’t a very good guide out there. The rating system on many sites easily becomes biased since the owner of any place can just rate it as many times as he wants and then his place will be at the top. Fair? Not really. This is something I have figured must happen since some of the places I’ve been to have had amazing ratings and if not mediocre coffee, it certainly hasn’t been top notch in town. Still, other places haven’t even been listed but have had some smashing stuff brewed up for me. Confusing but true. This project would then give me an incentive to do a thorough Michelin-taster-like, almost scientific research of the coffee places I stumble across, or, are looking for on purpose. What do you think? Who knows, it might even end up in a printed format one day. Coffee house no. 6 in my so far unscientific quest for perfect java is called Espressofabriek on Gosschalklaan 7. I wouldn’t call it a hidden gem since it’s really well frequented, however, it’s a bit off the beaten track and therefore you won’t just randomly pass it. You have to go there intentionally. And my recommendation is that you do. 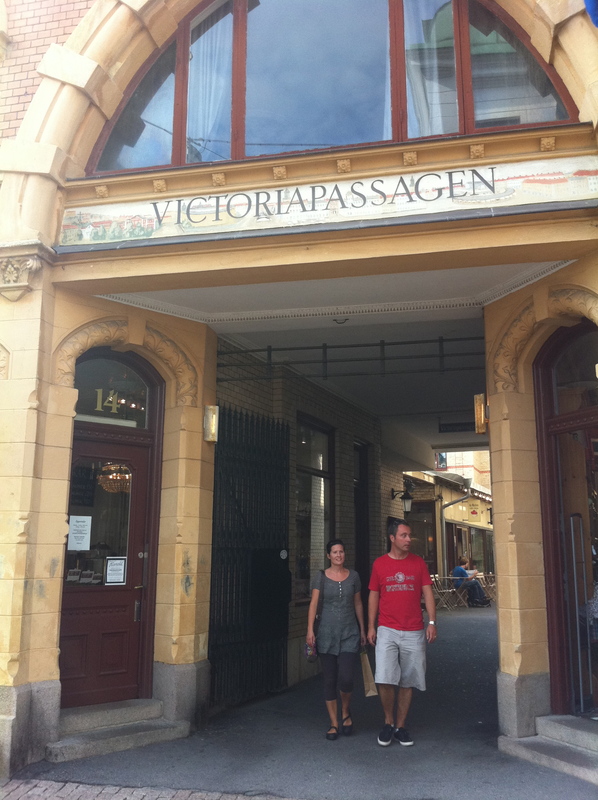 It’s reached easiest from the Central Station by bus 21 to Van Hallstraat or tram 10 to Van Limburgstirumplein. I know, the Dutch stops have really complicated names but rest assured you’ll find it sure enough with the great signs showing the next stop on both buses and trams. You can’t miss it. 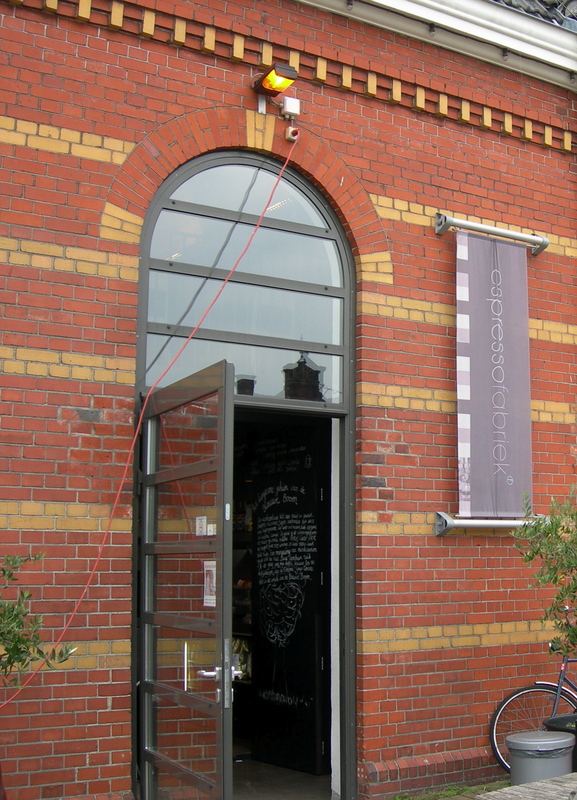 The Espressofabriek is then situated in a contemporary, culturally oozing area called Westergasfabriek. As the name tells you (!) it is the old gasworks turned hip and funky. Big lawns and old brick buildings are now home to arty boutiques and the creative arts in general with film companies, theatre groups and what-have-you. Exactly the kind of vibrant area I like. In the middle of this is the very New York like coffee place I was looking for. This time I wasn’t let down. S. found her latte a wee bit bland but my cappuccino was perfect. And more importantly this was the place that produced the best milk foam so far. It held up much longer than normally. Eureka! One also got a glass of water with the coffee without asking. I don’t necessarily need that but I find it really nice. Maybe more nice looking than anything else, but still nice. A big plus for that guys. With seating outside as well this will be lovely in a week or two, when the autumnal colours have started to explode and create an even more vibrant feel to the season lurking around the corner. 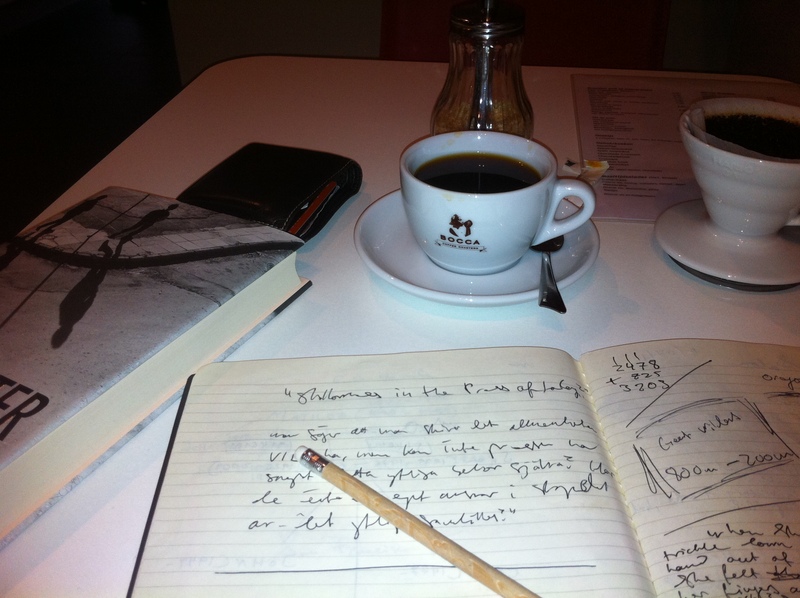 With a narrow but esthetically pleasing interior in black and off-white with massive chalk boards with “literary quotes” (more likely from contemporary pop songs than Proust, if you get my point) on coffee and life in general I felt really welcome. It’s not cosy the way I usually look for, but it works. It’s arty and it’s Amsterdam. A place with great coffee and good vibe. I think I’ve found a new coffee house for my Top Three list. This is becoming something of an obsession of mine. Mind you, when you’re in a new place for a prolonged period of time even people with an addictive behaviour disorder like myself can get way too enthusiastic over a project or a past time. Like finding new coffee places serving decent coffee. For those less interested in this quest of mine I promise to have a blog entry on a quirky fashion issue soon. 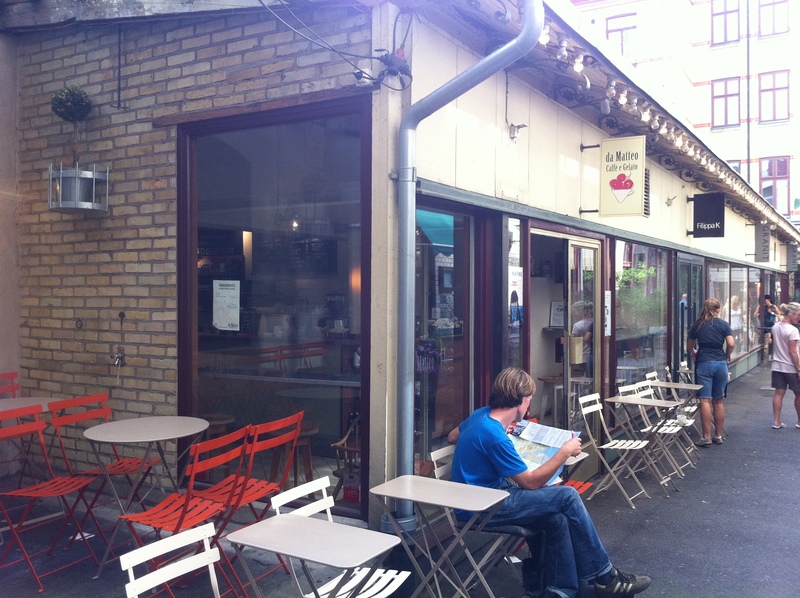 The latest coffee place I went to is just off Spui, towards Singel, hidden away in a little alleyway. It’s nice to walk around Amsterdam since these small alleys are just like the Closes in Edinburgh, just not as steep. They pop up more regularly in certain areas of the city than in others but are always really cosy and hiding interesting shops, cafés or bars. 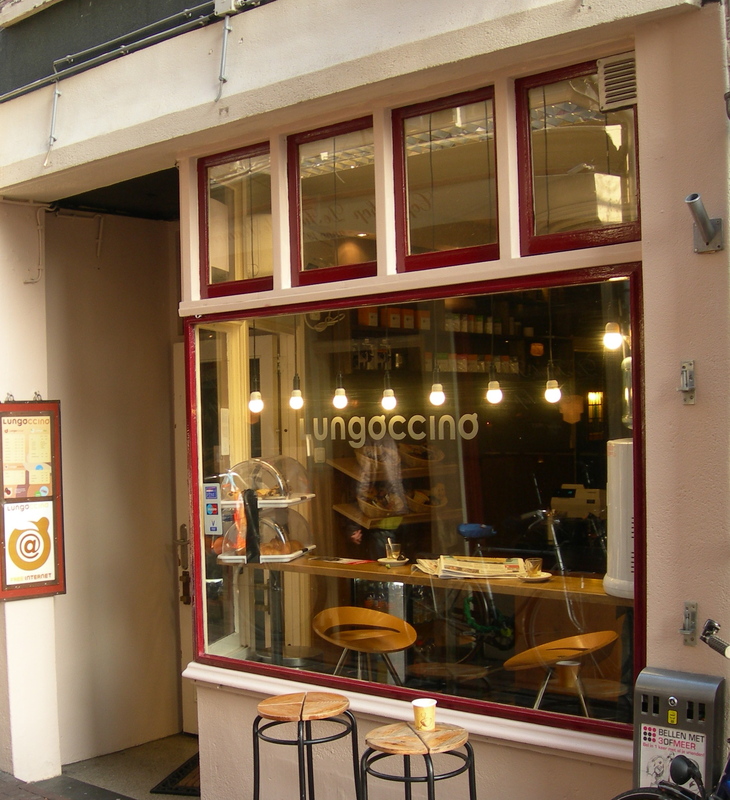 The place I took S. to the other day is called Lungoccino and can be found at Heisteeg 5. It is a really wee place so not for long lounging with your Sunday paper. But that’s okay since it is a small coffee bar kind of place with no intentions of being anything more than that. 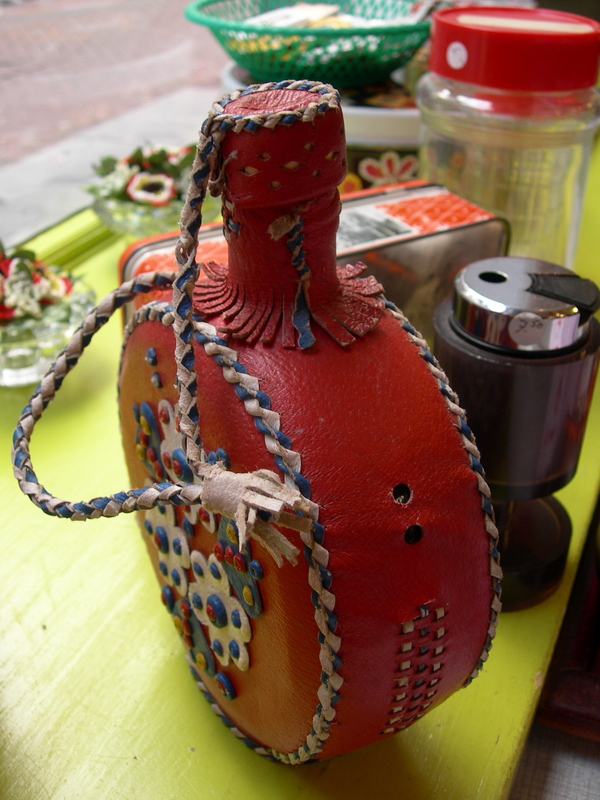 Great for an espresso or for take-away. It has been very highly ranked in an espresso ranking list over espresso places in Amsterdam so I thought I just had to try it when I had an hour off work and, well, so I did. Was it as amazing as one could expect? No. 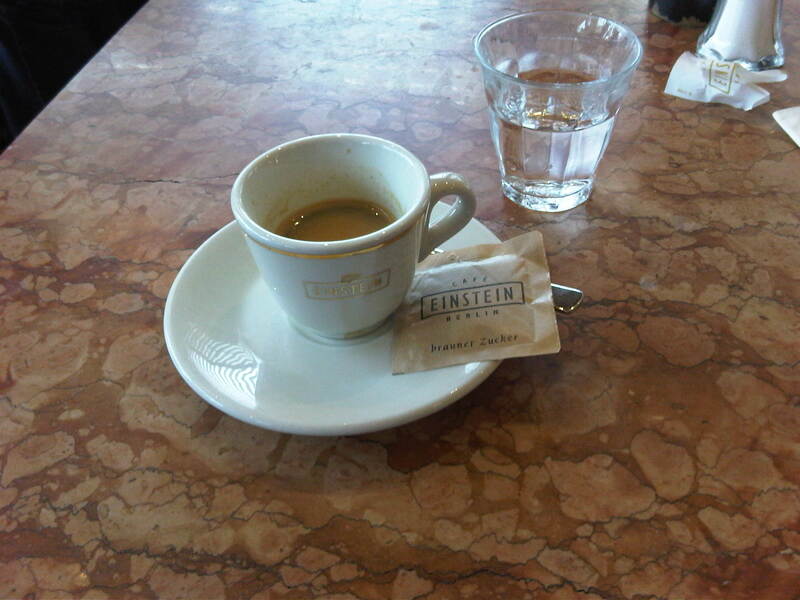 It was a very good espresso and an equally good macchiato, but to have the top ranking in Amsterdam? No way. The Feama machine did a good job, as did the barista on the day, but I don’t know what it was that made me feel let down. I think it was just a bit plain. No real roundness in the taste, no proper créma on the espresso. On the plus side it wasn’t bitter at all, so something obviously worked in Lungoccino’s favour. I can probably assure you won’t get a bad espresso, but there’s no need to run there first thing you’re off the train from Schiphol. Go to Coffee Connection instead. It’s so far the best coffee I’ve tried here in Amsterdam. It’s also much closer to the train station. The need for coziness has been aptly fulfilled and there’s no need to feel sorry for the state of coffee places in Amsterdam. As it was Sunday I and S. went for a stroll along the canals of Amsterdam and found this really nice little place past the infamous Red Light district, on Zeedijk 43. 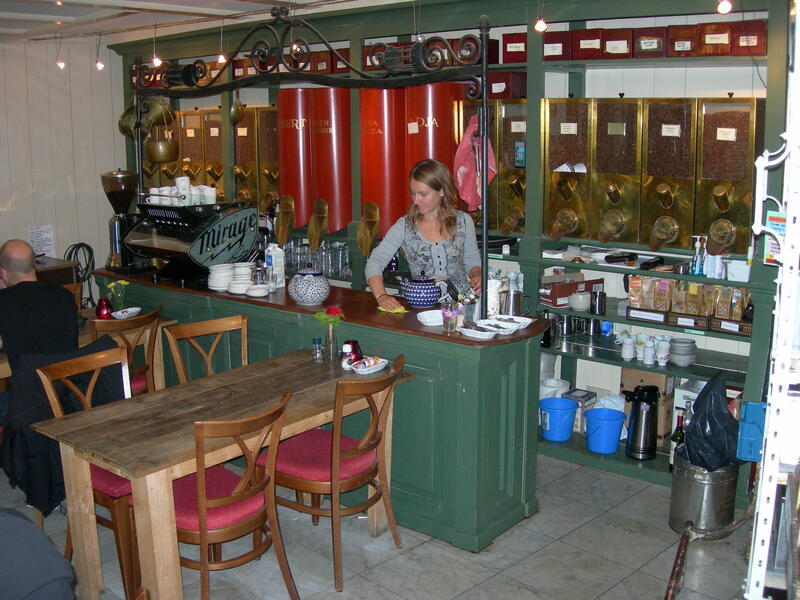 It’s called Wijs & Zonen and is one of the oldest coffee roasters in the Netherlands. Apparently. It was founded in the 18th century, I believe, but exactly when is a bit hard to figure out from the info on their homepage. After a couple of minutes browsing through the “history” section I got so tired and confused of all the dates and various families involved that I gave up. So if you really care you have to do the homework yourselves. Sorry guys. More importantly though, this is a place with real character. With its tiny forecourt it was lovely to sit outside for the first bit, drinking tea (!) and reading my beloved The Observer. 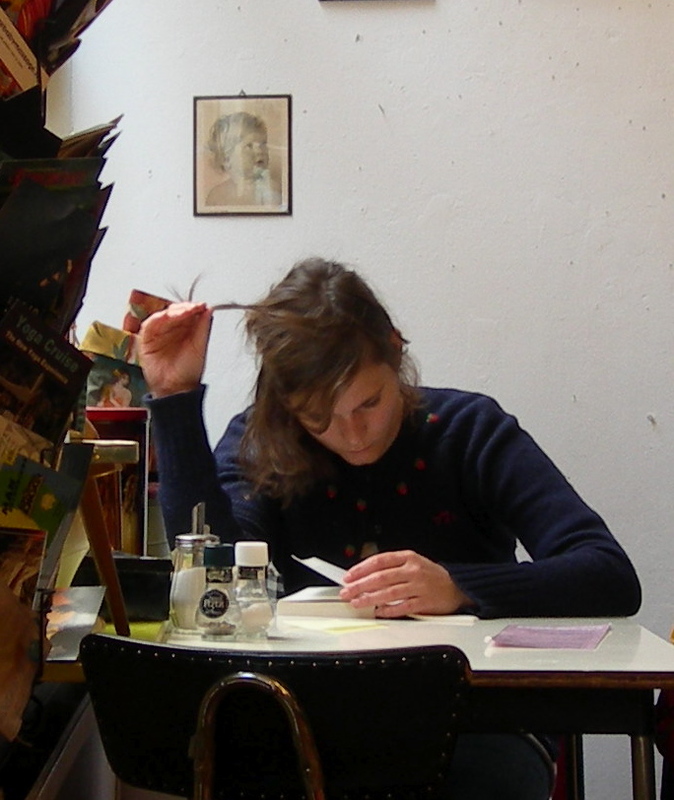 I have found this really nice place by Spui where one can get the British newspapers on Sundays and then simply find a nice spot to sit for hours, reading and drinking coffee or, like today, start off with a pot of tea. Sounds blasphemous, I know, but I just happened to crave a nice Assam tea this morning. The world’s blatantly gone topsy-turvy. Later on though, after the rain had started drizzling for the umpteenth time this week, I moved inside for a macchiato and the world order was restored. 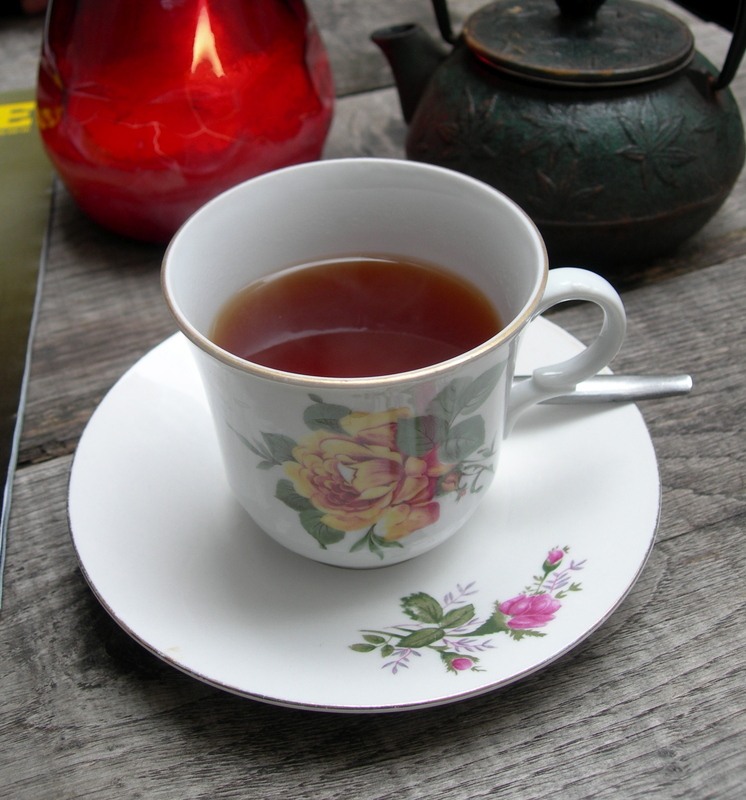 At Wijs & Zonen they roast their own coffee beans and blend their own teas to perfection. I guess that’s why they are Purveyors to the Royal Dutch Court. The coffee was good, not extraordinary in any way but really good. Nothing to complain nor to write home about. However, what made it a nice cup of coffee was that it had no hint of bitterness. None what so ever. They use an Indonesian coffee blend called Toradja Prince with a fairly low caffeine percentage, but regardless of that obvious flaw, it tastes really smooth and well rounded. I might just have to go back for a bag for myself. With that in mind I would really recommend a visit, but also since it is one of these places where you feel that you could sit forever. It felt like home, or like a good friends living room. The furniture is rustic but still welcoming. The white walls contrasts well against the darker furniture in the central part of the coffee house. In the back are the big cases and crates full of coffee beans and tea leaves, where you can also sit and look out on the little forecourt. The street in the front can be quite busy but it’s nothing you notice thanks to the coffee rooms being at the back of the shop where you can also buy their products. All in all this is a place, even if it wasn’t my greatest coffee experience so far, where I’d love to become a regular. For the nice staff and for the homely, home-made-pie sort of feeling. And not to forget: they have a house cat named Peppy, how great is that? A place with their own house cat just have to be gold!